Over 35 years of grilling leads to tastefully crafted burgers done to perfection. Designed for those with a big appetite and great style. 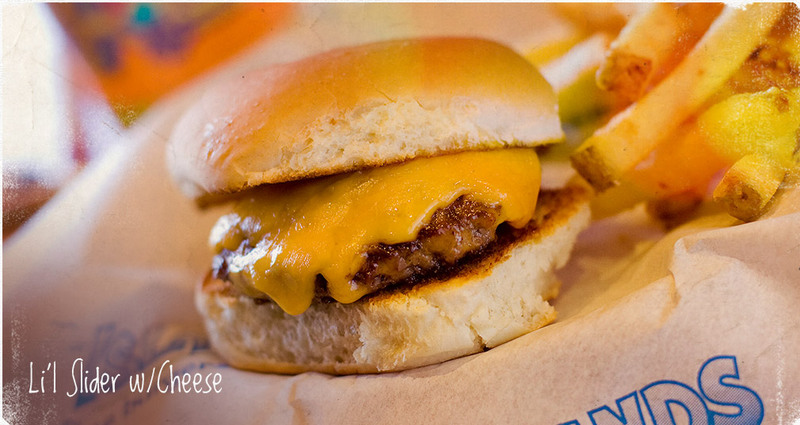 All burgers on our menu are served with an endless side of fresh cut Island Fries. All burgers have the option to substitute for Gluten Free buns. Lettuce, tomato, onion, pickles & mustard. American cheese, lettuce, tomato, onion, pickles & mustard. Jalapeño & black pepper-crusted burger w/pepper jack cheese, chipotle aioli, lettuce, tomato & Island Reds™. Thousand Island dressing, lettuce, pickles, onion & tomato. Sautéed mushrooms, lettuce, tomato, swiss & mayo. Lettuce, tomato, onion, pickles, american cheese, applewood smoked bacon & mustard. Guacamole, lettuce, tomato, onion, swiss & mayo. Fresh pineapple, teriyaki sauce, lettuce, tomato, onion, swiss & mayo. Chili, american cheese, lettuce, tomato, onion, pickles & mustard. 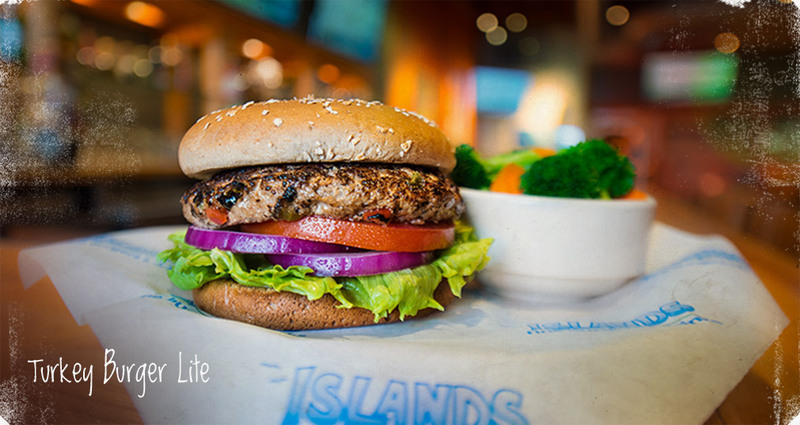 Substitute our tasty turkey or veggie patty for your favorite burger at no extra charge. Spicy white queso, crisp tortilla strips, pickled jalapeños, tomato, red onion, lettuce & salsa mayo. Best fries on the west side! Daily fresh-cut potatoes that are cooked to perfection and then tossed w/our own secret seasoning. Crisp chicken tenders served w/ranch dressing. 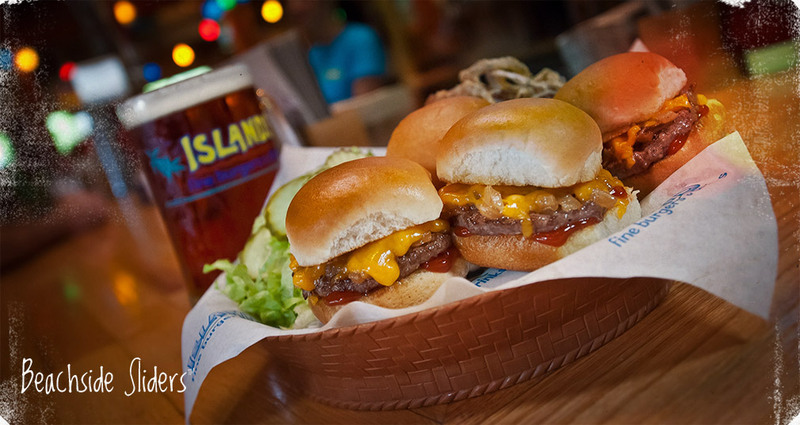 Four mini burgers w/caramelized onions & ketchup on toasted buns, served w/Island Reds™ & pickles. Cheddar, jack, jalapeños, tomatoes, refried beans & sour cream, served w/sides of salsa & guacamole. 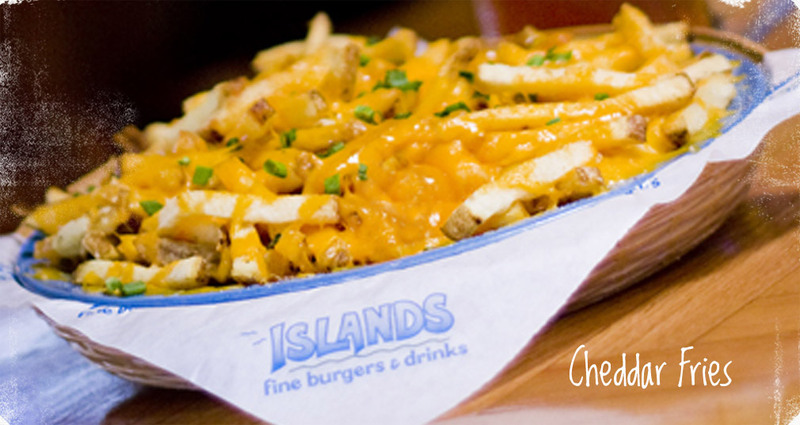 Fresh cut Island Fries covered w/melted cheese & scallions. Flour tortilla stuffed w/cheddar, jack, green chiles & topped w/scallions. Served w/sides of sour cream & pico de gallo. Traditional spicy sauce, served w/carrots, celery & ranch dressing. Also available in honey sriracha, teriyaki or bbq. Chopped spinach & artichoke hearts mixed w/sautéed onion & garlic in a creamy alfredo sauce, served w/fresh chips & salsa. Grilled & chilled chicken breast, mandarin oranges, snow peas, water chestnuts, carrots, fried noodles, sesame seeds, scallions & mixed greens, tossed w/sesame dressing. Grilled & chilled chicken breast, romaine, parmesan cheese, croutons & caesar dressing. 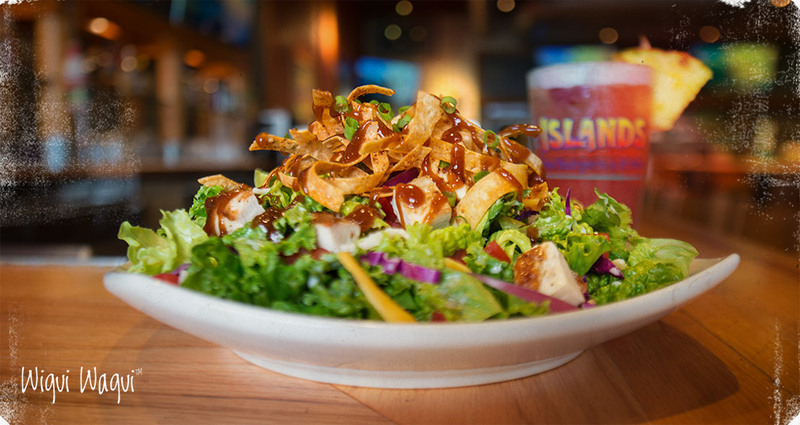 Grilled & chilled chicken breast, cheddar, jack, tomatoes, red onion, jicama & mixed greens, tossed w/ranch dressing & topped w/tortilla strips, bbq sauce & scallions. Grilled & chilled chicken breast, crumbled applewood smoked bacon, fresh avocado, Point Reyes bleu cheese crumbles, chopped hard cooked egg, tomatoes, scallions & mixed greens, tossed w/kobb dressing (creamy vinaigrette). A hearty soup w/chicken & fresh vegetables, topped w/jack cheese, avocado & tortilla strips. Grilled chicken, topped w/fresh grilled pineapple, red bell peppers, snow peas, water chestnuts, red onions, broccoli & diced scallions w/hoisin sauce, served over brown rice. Also available w/teriyaki sauce. Two flour tortillas stuffed w/grilled chicken, fresh grilled pineapple salsa, teriyaki sauce, cheddar, jack, lettuce & tomatoes w/a side of ranchero beans. 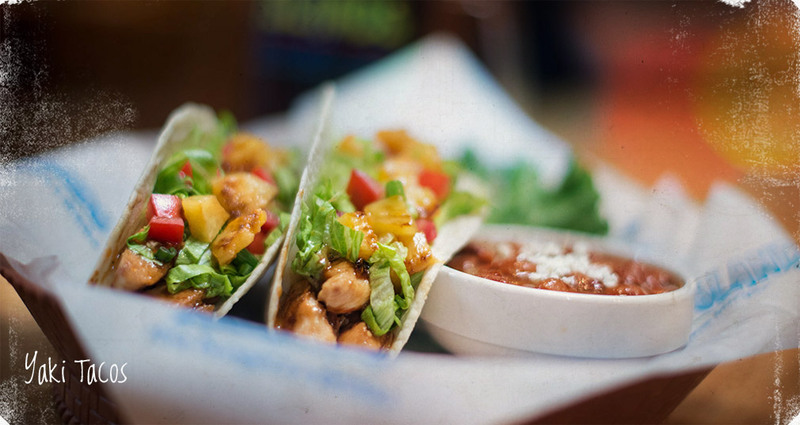 Two flour tortillas stuffed w/spicy chicken, cheddar, jack, lettuce & tomatoes w/sides of salsa & ranchero beans. Grilled chicken breast, swiss, lettuce, tomato, pickles & mayo. Grilled chicken breast, teriyaki sauce, fresh pineapple, swiss, lettuce, tomato & mayo. Grilled chicken breast, sautéed mushrooms, swiss, lettuce, tomato & mayo. Hand breaded fried chicken breast, w/applewood smoked bacon, swiss, red onion, lettuce, tomato, & ranch dressing. 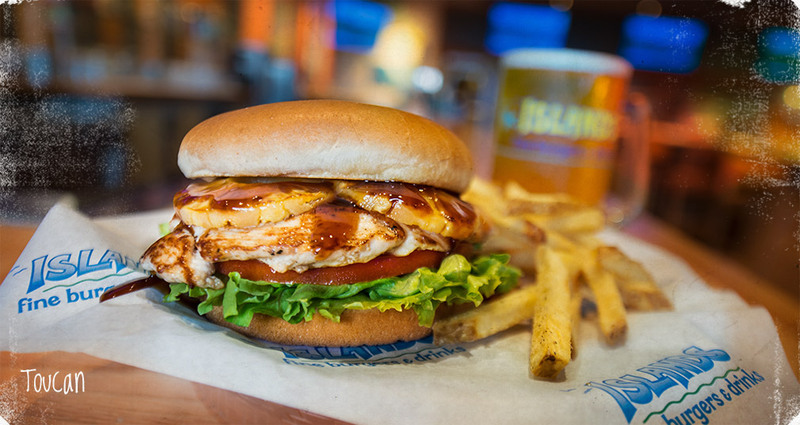 Applewood smoked bacon, cheddar, jack, lettuce, tomato & mayo, served on an Islands white or whole wheat bun. White albacore tuna salad, cheddar, jack, lettuce, tomato, pickles & mayo. Grilled & chilled sliced chicken breast, applewood smoked bacon, avocado, cheddar, jack, lettuce, tomato, ranch dressing & bbq sauce, served in a flour tortilla. Shapes aren’t just for boards. 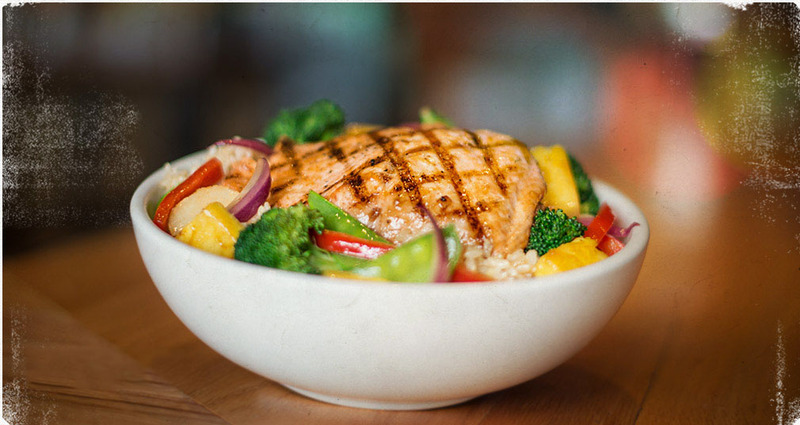 Stay in shape with our tasty low calorie menu options. Served on a whole wheat bun w/tomato, sliced red onion, lettuce & mustard w/a side of steamed broccoli & carrots (630 cal). Two corn tortillas stuffed w/spicy chicken, cheddar, jack, lettuce & tomatoes w/sides of salsa & ranchero beans (490 cal). Grilled & chilled chicken breast, hearts of romaine, kalamata olives, feta cheese, tomatoes, cucumbers & red onion tossed w/our own low fat balsamic vinaigrette (380 cal). Two corn tortillas stuffed w/a variety of grilled vegetables, cheddar, jack, roasted corn, black beans, pico de gallo & avocado, w/sides of salsa & Island slaw (480 cal). Cheddar, jack, jalapeños, tomatoes, refried beans, sour cream, & guacamole, served w/ a side of salsa. Our famous Island Fries are cooked to perfection w/zero grams of trans fat per serving. Burger patty, cheddar cheese, tomato, onion, pickles & mustard. Grilled chicken, tomato, pickles & mayo. For kids 12 & Under: A jr. sized burger patty w/your choice of mustard, mayo, pickles & tomato. Grilled & chilled chicken breast, crumbled applewood smoked bacon, fresh avocado, bleu cheese crumbles, chopped hard cooked egg, tomatoes, scallions & mixed greens, tossed w/kobb dressing (creamy vinaigrette). Two corn tortillas stuffed w/a variety of grilled vegetables & cheddar, topped w/roasted corn, black beans, pico de gallo & avocado w/a side of Island Slaw. Two corn tortillas stuffed w/grilled chicken, onions & peppers w/a side of Island Slaw. Two scoops of vanilla ice cream, chocolate syrup, whipped cream, diced almonds & a cherry. 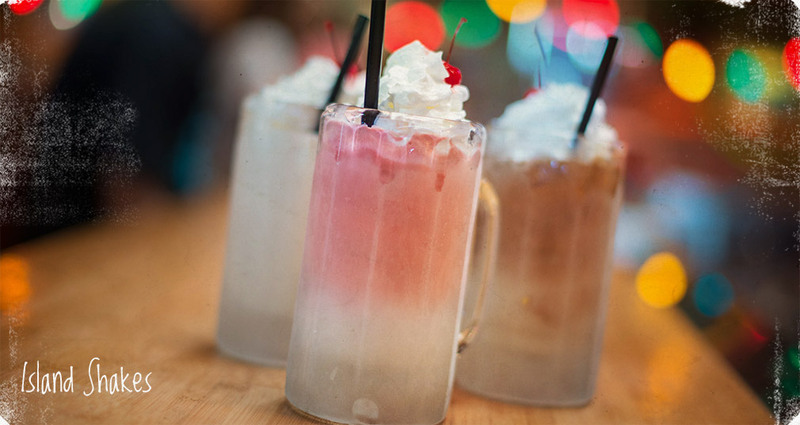 Vanilla ice cream, chocolate syrup, whipped cream & a cherry. (Perfect for sharing) Fudge brownie topped w/vanilla ice cream, chocolate syrup, whipped cream, roasted almonds & a cherry. 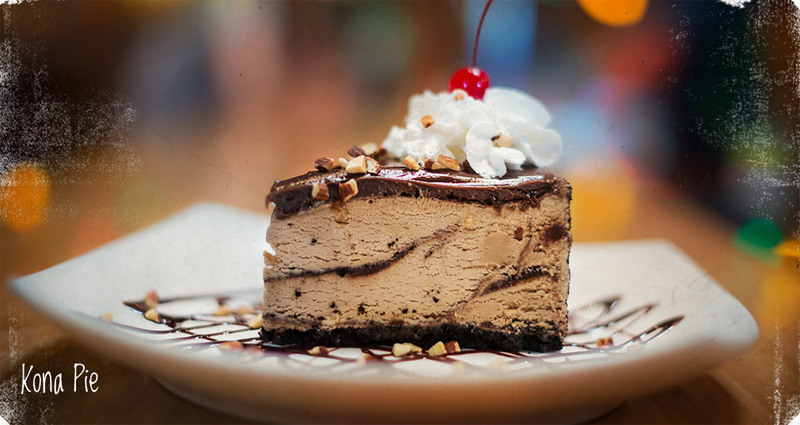 (Perfect for sharing) Mocha almond fudge ice cream & cookie crust topped w/chocolate fudge, whipped cream, roasted almonds & a cherry. (Individual size portion) Vanilla ice cream, chocolate syrup, whipped cream, diced almonds & a cherry. (Individual size portion) Rich fudge brownie served warm, topped w/vanilla ice cream.